ג לָשׂוּם לַאֲבֵלֵי צִיּוֹן, לָתֵת לָהֶם פְּאֵר תַּחַת אֵפֶר שֶׁמֶן שָׂשׂוֹן תַּחַת אֵבֶל–מַעֲטֵה תְהִלָּה, תַּחַת רוּחַ כֵּהָה; וְקֹרָא לָהֶם אֵילֵי הַצֶּדֶק, מַטַּע יהוה לְהִתְפָּאֵר 3 To appoint unto them that mourn in Tzion, to give unto them a garland for ashes, the oil of joy for mourning, the MANTLE OF PRAISE for the spirit of heaviness; that they might be called terebinths of HaTzedek, the planting of יהוה, wherein He might glory. This passage in Yesha-Yahu [Isaiah] has become one of my favorite scriptures, and the photo above one of my new favorites. 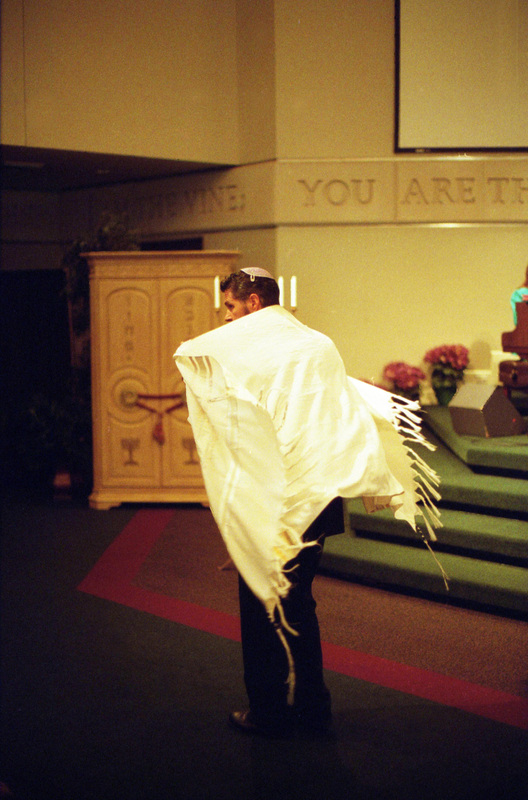 The first time I saw it, I thought, ‘how much like ‘wings’ does that tallit look as it is ‘decending’ on me.’ It’s a special picture, because it comes from the day my wife and I renewed our vows under the Khuppah three years ago, after twenty years of marriage. I was preparing for that ceremony. I have often ‘praised’ Elohim for giving me my “Eshet Khayil,” and that day I was happy to commit our marriage to Him again, and to affirm our continued trust in the Jewish Savior. The “Mantle of Praise’ has been on my mind, as I sing a melody frequently to these verses, and over the past few weeks, the ‘Ma’ateh Tehillah’ just seems to ‘glow’ in my mind as I contemplate these words while singing; I can’t explain it. The Jewish “Tallit,” what many call a ‘prayer shawl,’ is the modern [dating from the Middle Ages] garment worn at the Beit K’nesset [Synagogue] of Jews on Shabbat. But, the custom of having an outer garment that is used for prayer goes back to the very beginning of real Judaism. While it is not ‘on the surface’ of the text until much later, it is nonetheless a well-known, historically prevalent feature of Jewish dress and custom, and is heavily alluded to even in the beginning of the Torah. When Y’hudah gave pledge to Tamar, she asked for his signet ring, his staff, and his ‘cord,’ which does not mean much to the modern reader. There, the words are : וּפְתִילֶךָ, וּמַטְּךָ . This is your ‘petil’ and your ‘staff.’ But, look very carefully at the second word [right to left], because it ‘sounds’ just like the word Ma’ateh in our subject: mantle. That is likely a hint. The petil is ‘thread,’ but notice how she asked for HIS thread. This is not just any ‘string’ hanging off his clothes. These are the ‘tassles’ that Jewish men wore on their four-cornered outer garment! When יהוה instructs them to make tassels in BaMidbar 15 [Numbers], He is telling them to make a PETIL of TEKHELET. A thread of BLUE [light blue]. They already wore tzit-tziyot! There are ancient pictures of Ivrim [Hebrews] in Egyptian hyroglyphs that show them wearing tassels! Abba was just modifying their own custom! The blue thread is made with the same color, ‘Tekhelet,’ that was used to make the whole robe of the High Priest, to remind them to keep the commandments of יהוה. This ‘Ma’ateh’ is also called an ‘ADERET,’ אַדֶּרֶת, which is just another word for ‘mantle,’ the outer cloak of ancient Jewish men. It was distinct from the clothing of other nations. This is seen in the book of Yehoshua, where Akhan takes a ‘Babylonian Aderet’ because he coveted it. Taking the garment of Babylon [and other treasures] got some men of Yisra’el killed! That’s because in all ancient near-east cultures, the outer garment was more than a ‘shirt;’ It was one’s own personal ‘tent,’ used in worship. The problem with a Babylonian garment is that their deities were all sexual deities, and their garments used in those rites! Since Eli-Yahu is a good Jew, we know his ‘outer garment’ of ‘four corners’ would have had the Tzit-Tziyot on it, with a Petil Tekhelet [thread of blue.] “You shall make for yourself twisted cords on the four corners [literally ‘wings’] of the garment in which you wrap yourself.” גְּדִלִים, תַּעֲשֶׂה-לָּךְ, עַל-אַרְבַּע כַּנְפוֹת כְּסוּתְךָ, אֲשֶׁר תְּכַסֶּה-בָּהּ [D’varim 22:12, the affirmation of the command in BaMidbar 15:38-41] Eli-Yahu wrapped his face in his four-cornered garment, for prayer, and heard the ‘still, small voice’ of יהוה. This, too, was a long-standing custom in Yisra’el, as David had wrapped himself up for prayer in his at one point, as well. Eli-Yahu’s ‘aderet’ was always on him, and so the ‘ruakh,’ or spirit, that was on him, the ‘anointing’ that was on him, affected that very garment! Eli-Yahu’s mantle is clearly the symbol and in some means the ‘bearer’ of his ‘anointing,’ since Eli-Sha had just asked for a ‘double portion’ of his anointing, and received it via the ‘aderet’ falling out of heaven! So Eli-Yahu’s aderet/mantle, his outer garment, which bore the petil tekhelet, was used for prayer, and was a symbol of his anointing. So, why is it called a “Tallit” today? which means ‘roof,’ and adding a suffix ‘it’ meaning ‘little,’ i.e., ‘little roof’ or ‘little tent.’ This has long been the understanding of what the Tallit is, a personal ‘tent’ for prayer. This is why men in our Jewish Synagogues ‘wrap’ their family in their tallit during prayer. So, a Tallit is a VERY biblical thing, and is a daily reminder of the PRAISE Messiah has given to Yisra’el, those who have been healed of their broken hearts, and had the blinders lifted off their spiritual eyes. There is so much more to the Tallit than I can even cover in this short span of time. But it is a custom that is deeply rooted in Yisra’el, in Torah, and in Messiah Yeshua Himself. He wore one, and the woman who touched the ‘kanaf’ where his Petil Tekhelet hanged was instantly healed.